Modern Elegance Nestled in the Jungle. 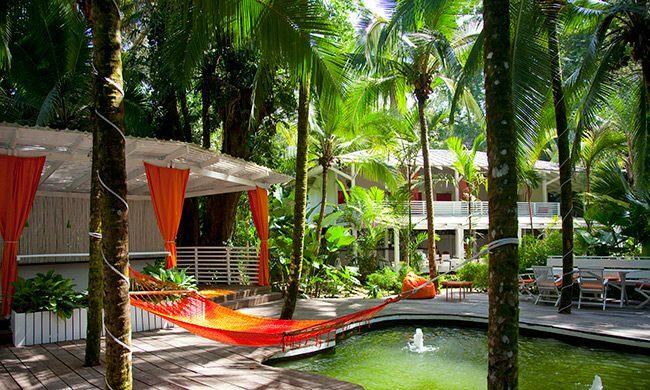 Located between the vibrant beach town of Puerto Viejo and the more mellow Manzanillo, Le Cameleon Boutique Hotel is a unique spot along the Caribbean coast. This member of Small Luxury Hotels of the World is ideal for any type of traveler that is looking for a luxury experience while being surrounded by the rainforest. Although it’s only 15 minutes along the coast to Puerto Viejo, the hotel has a secluded and peaceful feel that you can’t get right in town. The 23 minimalist rooms are elegantly designed featuring contemporary decor. Each room highlights a pop of color which is changed daily adding warmth and fun to the ambiance. Rooms have all the comforts you need such as A/C, a safe box, a telephone, WiFi, cable TV, a minibar, and an iPod dock. At Le Cameleon Beach Club, just across the street on Cocles Beach, you can enjoy activities like yoga classes, spa treatments, live music, and a bar/restaurant. Le Numu Restaurant serves a varied menu, including local favorites. Be sure and check out Happy Hour and events like Caribbean Nights. When you need a break from the beach, spend time lounging at the pool. The Beach Club offers daily activities and is an ideal spot to enjoy an exclusive selection of beverages and live music. The hotel’s daily changing decor is truly wondrous to see. Cocles Beach, with its beautiful golden sands, is within walking distance from the resort.